Well, hello Wednesday! We're half-way through the week, and I am so happy to finally wake up this morning liberated from the curse of this crazy sore throat/ear-ache thing that's had me down and cranky for the past few days. Since teaching, really talking period, has felt like I have a lawn mower in my throat, school work has been kept to a minimum, and reading taken over as subject of necessity. Despite being somewhat handicapped in the teaching department, I am pleased to report that my sign language and facial expression skills, as an effective means of communication, are sharp as ever - particularly the eagle eye/stone cold stare/eye brow arch, karate chop combo. The fact that our troops are great readers, really does make me very happy. I, too, love to read, I'm just in this awkward phase right now (is a phase really a phase if it's lasted for four years?) where reading works like NyQuil plus hypnosis on my brain. I open the book, ready to be inspired and enlightened, and before I can turn the page, I've turned into a bobble head rapidly spiraling into taco neck, and the kids are shooting paper wads at me (or sneaking gum from the pantry). Bandits. Long gone are the days when I could stay up until 2:00 a.m. reading A Tale of Two Cities under the covers by flashlight. I miss those days. I really hope they come back. Perhaps after these children stop needing me and my mad laundry/culinary/refereeing/trampoline skills. Since reading is the topic for the day, I thought I'd share with you our current literary picks. First up, Andrew. On any given day day, if you're looking for this boy, more than likely he's reading a book somewhere quiet. Books are to Andrew as chocolate is to his mama - meant to be devoured. Last weekend, at his wrestling meet, while most kids were playing video games or listening to music on their Beats headphones, my guy was reading to pass the time between matches. He is loving the The Hobbit, by J.R.R. Tolkien, which he says is far better than the movie, because it has so many more interesting details that he can't believe Hollywood "forgot about". As a Kindergartner, Henry is just beginning his reading journey. Teaching our children to read is one of my greatest joys. The experience never gets old. Every time their faces light up with delight, realizing that they have just mastered a new word or phrase, is as exciting for me as it is for them. Henry is cruising through the BOB Books by Bobby Lynn Maslen, a supplemental reading set that I use to enrich our kindergarten curriculum. His incentive to master each box of books is, at the completion of each one, a trip to the quick shop for a treat of his choice. As of yesterday, he wants beef jerky and an Icee. Delightful. I wish I could say that George's heart beats like mad for books, but that would send me to the confessional. Once he gets into a story, he's good to go. The challenge is getting him to park his bottom somewhere long enough to get past the first page. This duty has been lessened given that the cold temps have kept the kids inside snuggled up around the fireplace playing games and reading. Some days wrestling a steer seems easier than holding down George's attention to a focus, but The House on the Cliff, by Franklin Dixon, one of the Hardy Boys series, is doing a pretty good job of it here lately. Isn't his robe a scream? If you know my George, the flames are a totally appropriate expression of his personality (thank you, Grandma!). Now that our oldest son, Benedict, is going to school, I really do miss seeing him in all of the pics that I snap of the boys during the school day. 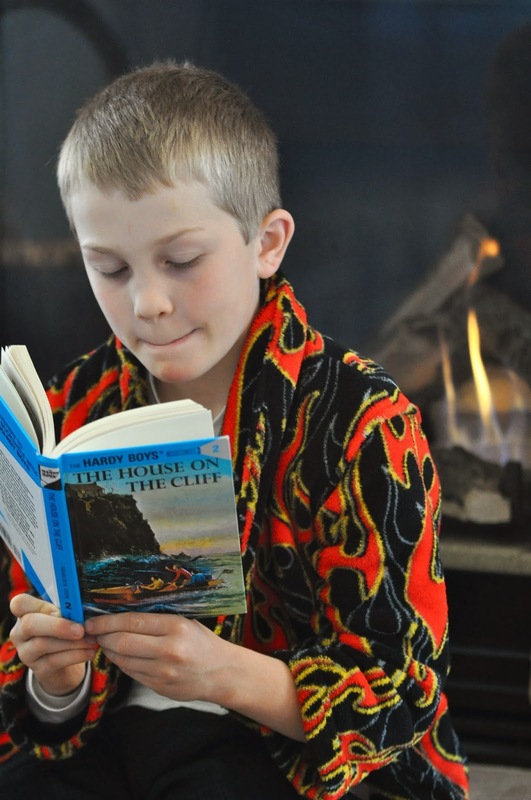 This is the boy that rises at the first sound of his alarm in the morning, makes his own breakfast, and allows himself just enough time to read - yes read - before it's time for me to take him to the bus stop. He's actually my alarm - it's the crash of the toaster banging on the kitchen counter like a gong that gets me going in the morning. I'm so thankful for him! As a thoughtful, contemplative soul, Ben is very particular about what he reads. 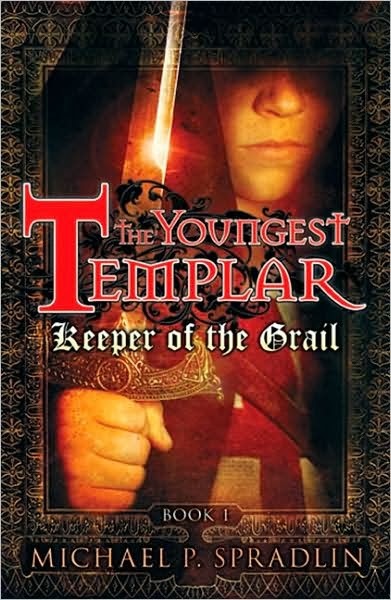 He has really enjoyed all of the books in The Youngest Templar Series. I don't think they are as challenging as many of the books he has read, but the story line, for him, is quite captivating. You didn't think I'd forget Mr. Chuckles, did you? Without fail, if we're reading, he's reading. His cute little routine is to cha-cha-cha down the steps to the boys' library, drag up as many books as his chubby fingers can grip and wherever he lands, scan every page 1,000 times. 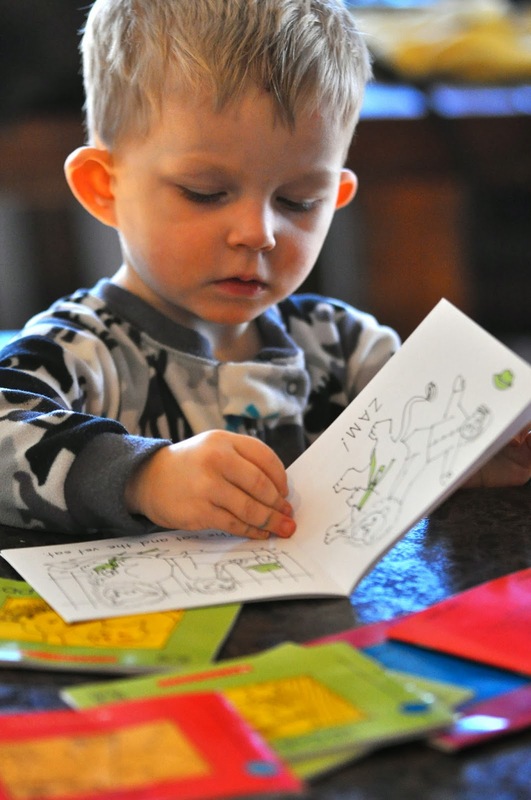 I love to watch the little ones as their pudgy little fingers work so hard to turn the pages, making sure they only turn one at a time. Then, just as they find a page that looks familiar, their eyes light up as if they have just discovered a dear old friend. Books can be like that, can't they? Like dear old friends? As for me, when I can keep my eyelids propped open, the boys and I are really enjoying Where the Mountain Meets the Moon as our afternoon read-aloud. It's is a curious combination of Chinese folklore and fantasy, a story that keeps the boys asking for me to "read on!" 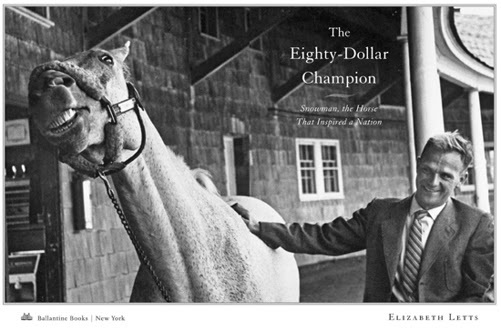 A couple of weeks ago, I finished The Eighty Dollar Champion by Elizabeth Letts. If you are drawn to biographical works that are inspiring and uplifting, this one will not disappoint. Letts successfully weaves Henry de Leyer's present life as a Dutch immigrant and his relationship with an unlikely show horse, Snowman, with his past memories and experiences as a victim of war. A documentary of Snowman is due to be released sometime this year. You can see clips of Harry and his champion horse on You Tube. kids have enjoyed? Please share!! 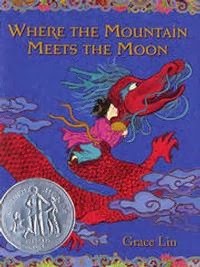 Oh, we read Where the Mountain Meets the Moon earlier this school year and we LOVED it. I would read to the boys for hours just to see what was going to happen next! I miss the days when the boys wanted us to read out loud to them!! My oldest is a huge fan of The Hobbit and actually JRR Tolkien in general!!! And, I tried for years to push the boys into reading the Hardy Boys because I loved them so much but they have never read a single one. Oh, well, I'm just happy that they love to read!! And, Charlie has to be the cutest thing - I love the idea of clapping after accomplishing something and even a self-cheer - pretty sure more of us could benefit from that!!! I learned to read with the BOB books - so fun to see those in your post! When I read "The Ordinary Princess" to the girls, I had 3 boys who just happened to hang around the entire time. The all liked Mrs Piggle-Wiggle, too. It seems though that any time I try to read something aloud to the kids, once we pause, the book disappears, only to reappear tangled in someone's covers and everyone somehow knows what happens next. I almost never get to finish anything with them!